Early analysis of the Tax Cuts and Jobs Act, signed into law in December 2017, suggests the new legislation could sharply reduce charitable giving in 2018, with one study projecting an $11 billion shortfall compared to last year. However, a closer look at the language of the law reveals opportunities for taxpayers to potentially retain some of the tax benefits of giving. This month’s Wealth Management Insights takes a look at the state of charitable giving and some strategies to maximize their impact. While changes in the law are likely to discourage charitable giving overall, there are still tax benefits available for the philanthropically inclined. The Tax Cuts and Jobs Act made several big changes that are expected to reduce charitable giving, including lowering individual income tax rates, doubling the standard deduction and nearly doubling the estate tax exemption. These changes either reduce the value of tax deductions as a whole or disincentivize itemizing deductions. Notably, though, the new legislation doesn’t limit charitable deductions themselves – in fact, the amount of charitable gifts that can be deducted each year was actually increased to 60 percent of adjusted gross income for cash gifts. In addition, the new law repeals the Pease limitation, which phased out up to 80 percent of the benefits of charitable deductions for higher-income taxpayers. In particular, the increase to the standard deduction will have a major impact on charitable giving. The standard deduction for married couples filing jointly jumped to $24,000, meaning a standalone charitable gift below $24,000 will not create additional tax benefits. However, taxpayers who traditionally donate more than $12,000 per year to charity might benefit by “bunching” two years’ worth of annual gifts into one year. Doing so would allow them to surpass the $24,000 threshold, take a deduction on the surplus and then apply the standard $24,000 deduction the following year. Plus, by using donor-advised funds, the taxpayer can arrange it so the charity would still receive the same donation amount each year, even with bunching. A qualified charitable distribution is also a tax-efficient way for IRA owners subject to required minimum distributions to donate to nonprofits. Owners of an IRA become subject to required minimum distribution rules in the calendar year in which they turn 70½ and must make their first withdrawal by April 1 of the following year. By sending the RMD amount directly to the charity through a qualified charitable distribution, they could care for their favorite causes, reduce their taxable income and still take the standard deduction. The result is a tax form with less reported income and potentially lower Medicare income-based premiums, depending on their past income. While on the whole the new tax law might discourage taxpayers from itemizing their deductions for charitable gifts, it does provide many avenues to maximize their impact. 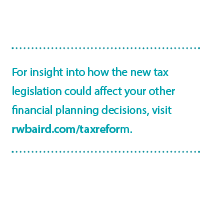 Your Baird Advisor can help guide you through the many tax-efficient gifting strategies available.